NEW! Stores in the bell for easy transport! The Hercules DS410B TravLite In-Bell Trumpet Stand offers a compact design for storage inside the instrument bell when your trumpet is in its case. The Hercules TravLite Trumpet Stand features a velvet base to protect the interior finish of the instrument bell plus a folding five-leg design for a compact size of 7-inches in length. 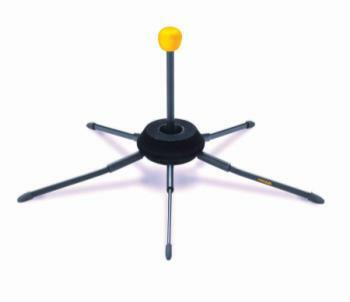 The Hercules DS410B TravLite In-Bell Trumpet Stand is available in black and yellow finish.